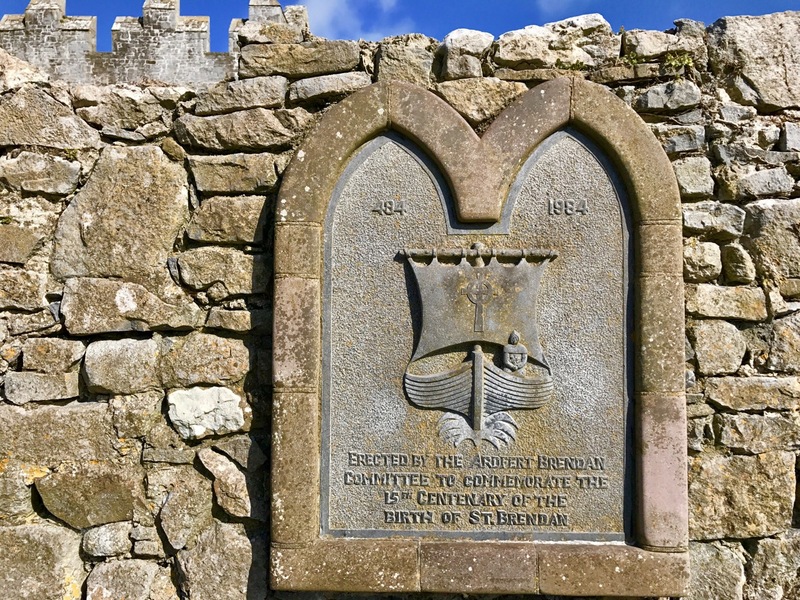 Our first call was to the Cathedral in Ardfert, which was built in medieval times over a Christian monastic site founded by the Saint in the sixth century. There’s nothing left of that, but the later buildings, while ruined, are well looked after by the Office of Public Works, and an information centre is open through the summer months – certainly worth a visit. 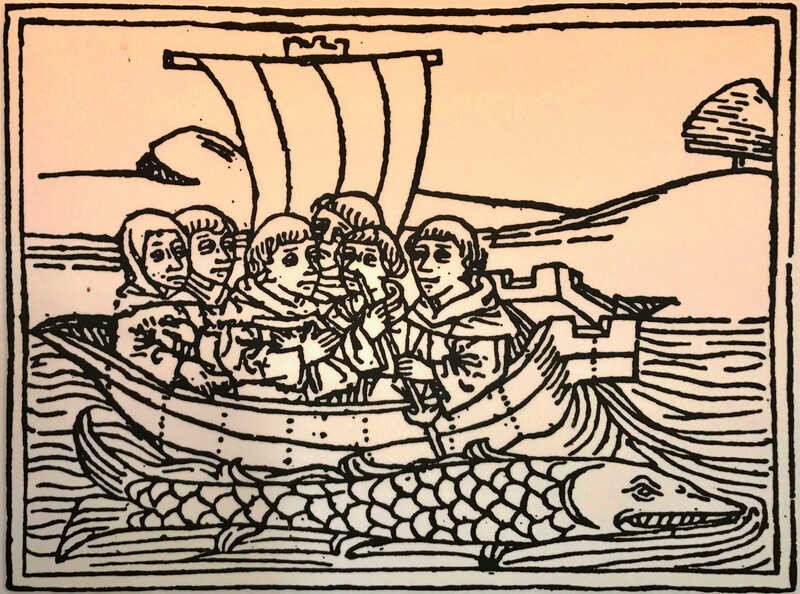 Seen in Ardfert Cathedral, an image of a woodcut dating from 1479: it shows St Brendan and his monks on their epic voyage in search of Paradise. On the way, they discovered the American continent! 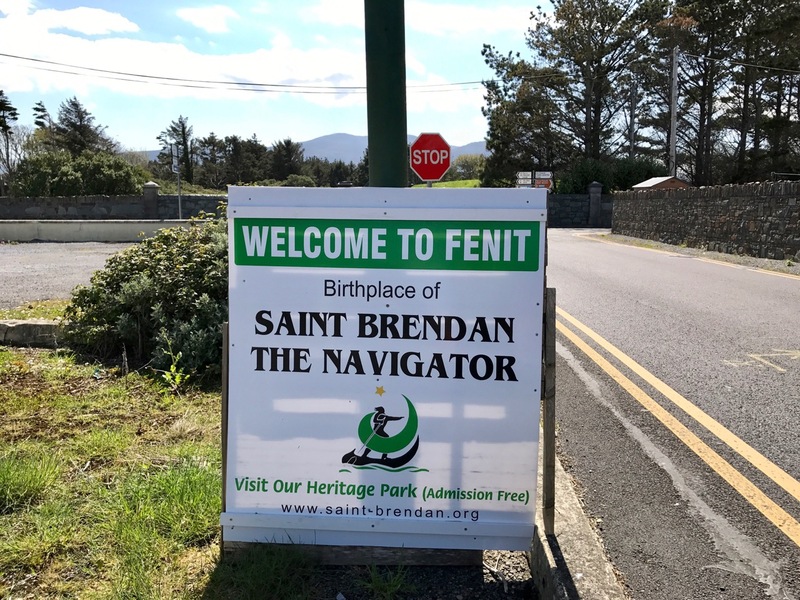 We could not miss a visit to the place of the Saint’s birth in 484 – Fenit, near Tralee – where a monumental bronze sculpture was installed in 2004. It was made by Tighe O Donoghue/Ross of Glenflesk. 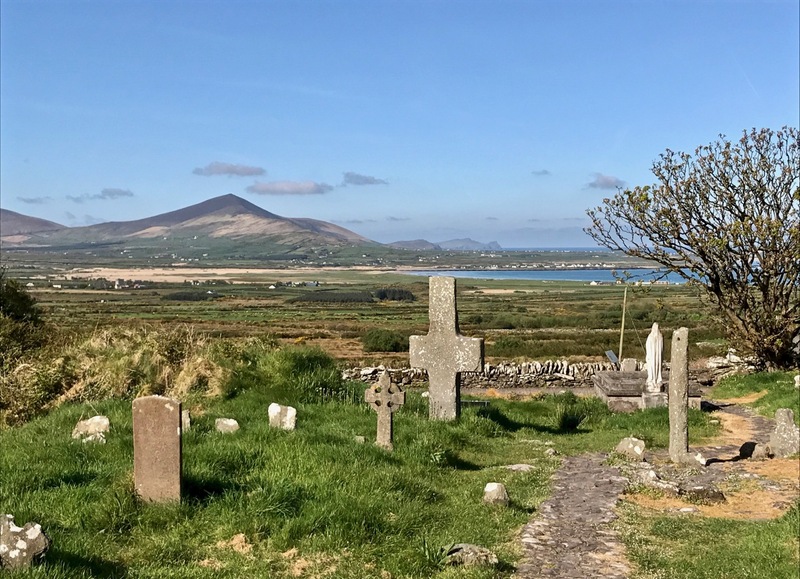 The culmination of our Brendan travels for this trip (there’s so much more yet to be explored) was the medieval site at Kilmalkedar, on the Dingle Peninsula. 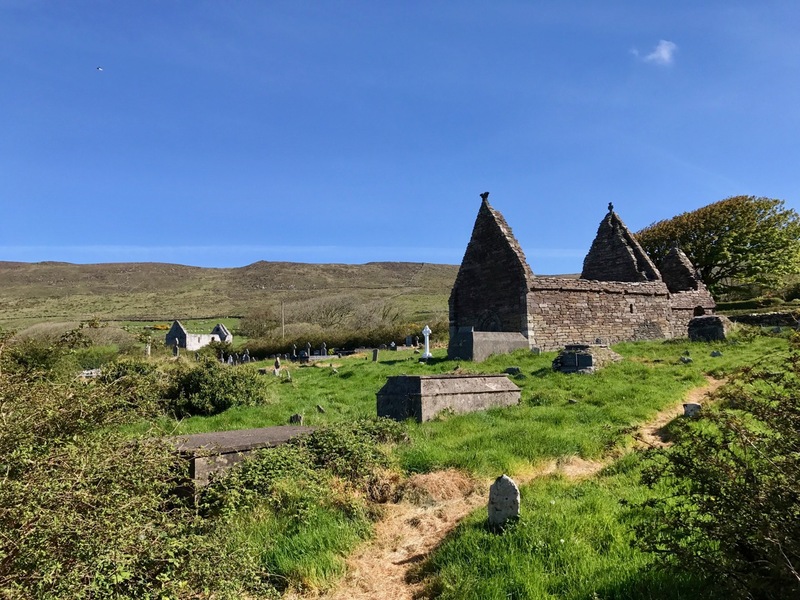 This monastic settlement is rich in history, and includes St Brendan’s House, and St Brendan’s Oratory. 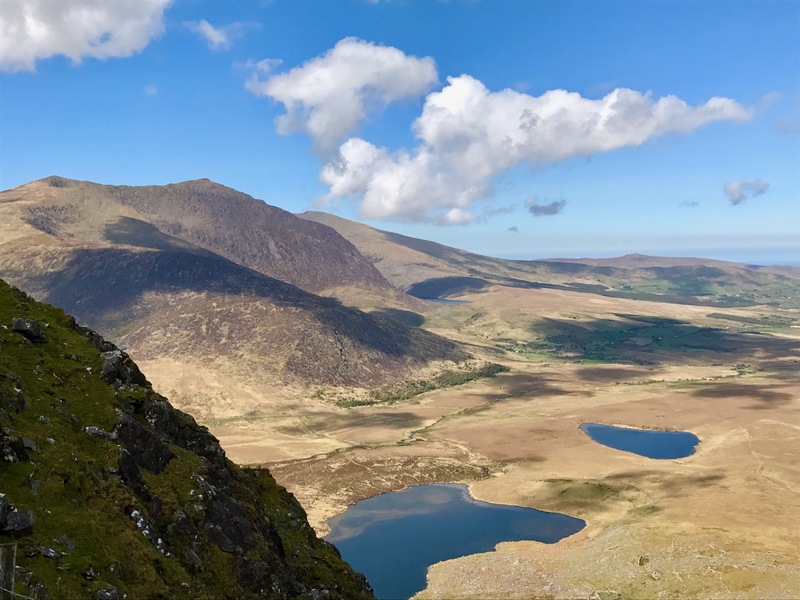 These alone are spectacular monuments, but there are further riches to delight the eye of Irish history enthusiasts. 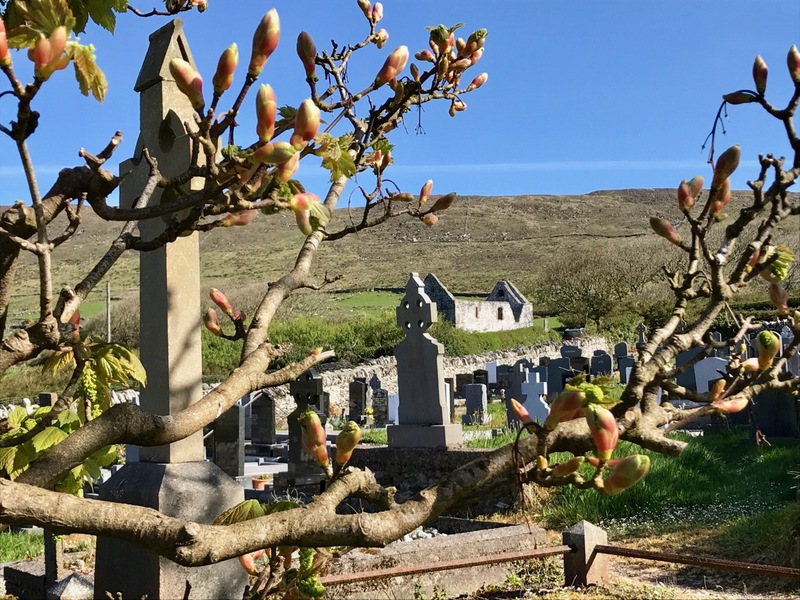 Finola’s post this week concentrates on the wonders of Irish Romanesque architecture, and the ancient stone-roofed church at Kilmalkedar is a prime example. 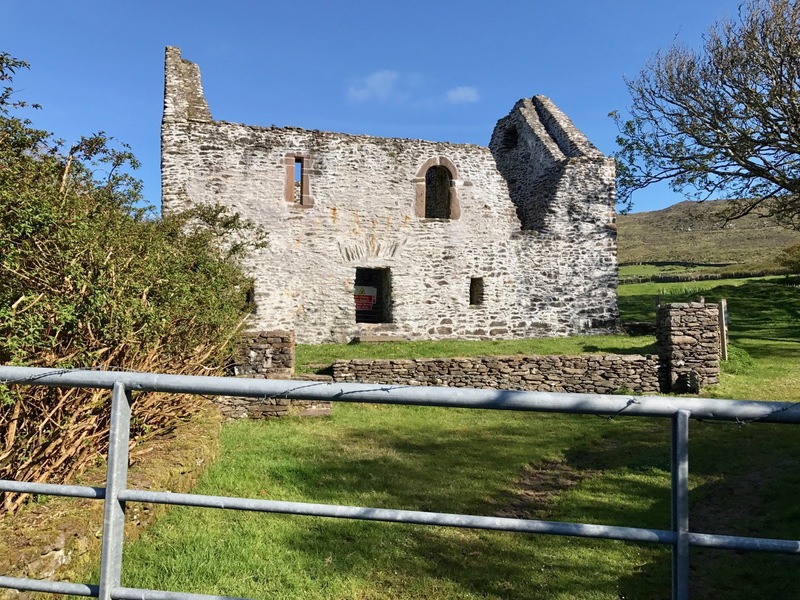 St Brendan’s House – behind a locked and barbed gate! 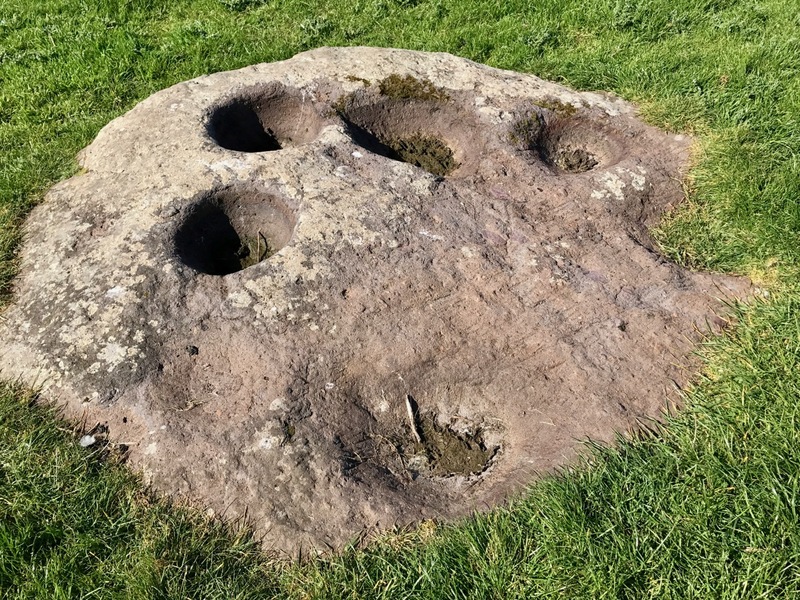 One of the special features of the Kilmalkedar site harks back to its medieval monastic associations – a sundial. The ordered lives of the monks were regulated by divisions of the day (and night) – the Canonical Hours, also known as the Divine Office or Liturgy of the Hours. These were the regular periods of prayer: seven daytime Offices of Lauds (at daybreak), Prime, Terce, Sext, None, Vespers, Compline (at sunset) and a night Office of Vigils. This was the important work of the monastery, of course: constant and regular prayers. In between it the monks had to fit in all the requirements of daily life: sustenance, growing crops, brewing, beekeeping. And, on top of all that, Brendan and his companions undertook their peregrinatio all around the known world. No wonder a timepiece was necessary! 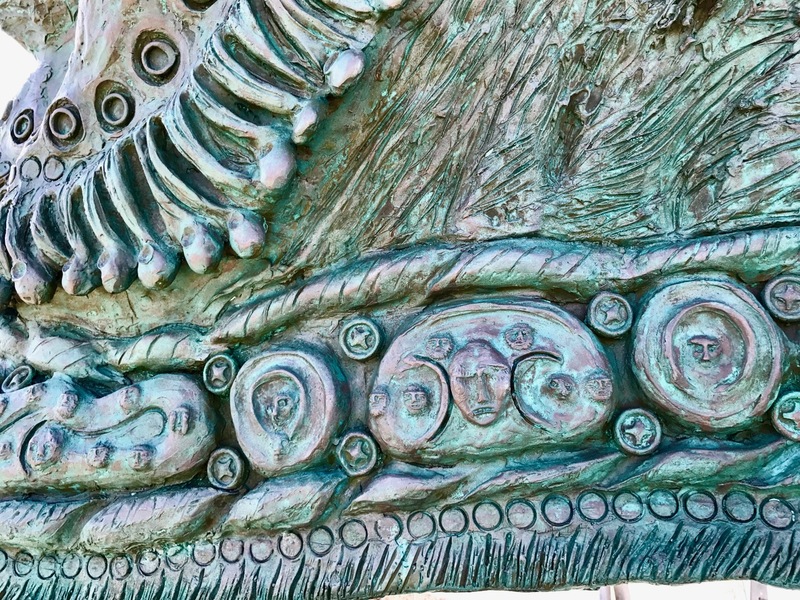 The Kilmalkedar sundial is a particularly elegant example – it’s probably my favourite item on this site: functional and beautiful, as all things wrought by the human hand should be. In such an evocative environment it certainly helps us to cast our minds back to the life and times of the travelling Saint. 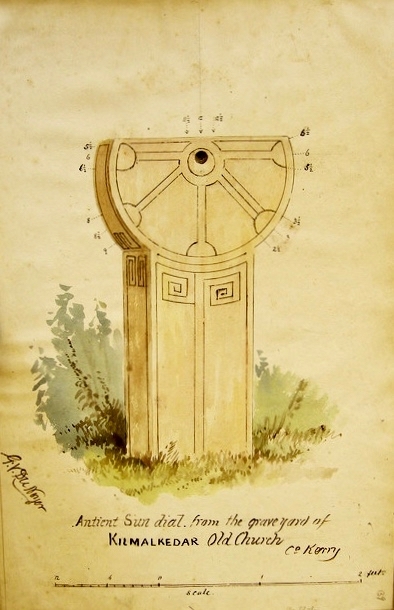 The antiquarian George Du Noyer visited the place back in the 1860s, and was also drawn to this particular artefact, accurately recording it for us in one of his exquisite watercolour sketches. This entry was posted in Archaeology, Folklore, Following Saint Brendan, Graveyards and Headstones, Irish Art, Irish Heroes, Irish History, Irish Landscape, Kerry, Medieval History, Religion, West Cork Blog, Wild Atlantic Way and tagged An Chonair, Ardfert, Fenit, George Du Noyer, Kilmalkedar, Kilmalkedar Ballaun Stone, Kilmalkedar Sundial, Liturgy of the Hours, Mary Jane Fisher Leadbeater, Saint Brendan, St Brendan's House, St Brendan's Oratory, The Widow's Marvellous Cow, Tighe O Donoghue/Ross of Glenflesk. Bookmark the permalink. This is such a peace-filled place. Burials were still taking place when I last visited, about ten years ago. Four men hacking away at the undergrowth to expose the gravesite on a hot day provided an interesting pastime as we explored the cemetery, reading ancient inscriptions as we could. The sundial is fascinating indeed. A great unsung attraction near Dingle town. Thanks for the information on a wonderful peaceful spot to visit. What better place to explore? This is such an amazing site isn’t it, so many interesting things to explore. The sundial is especially fine but I don’t think I knew about the ballaun stone and it’s lively history! Shame about the barbed wire, insensitive when it’s such an important site. And what an incredible setting, looking its very best today. See the reply to the comment below. 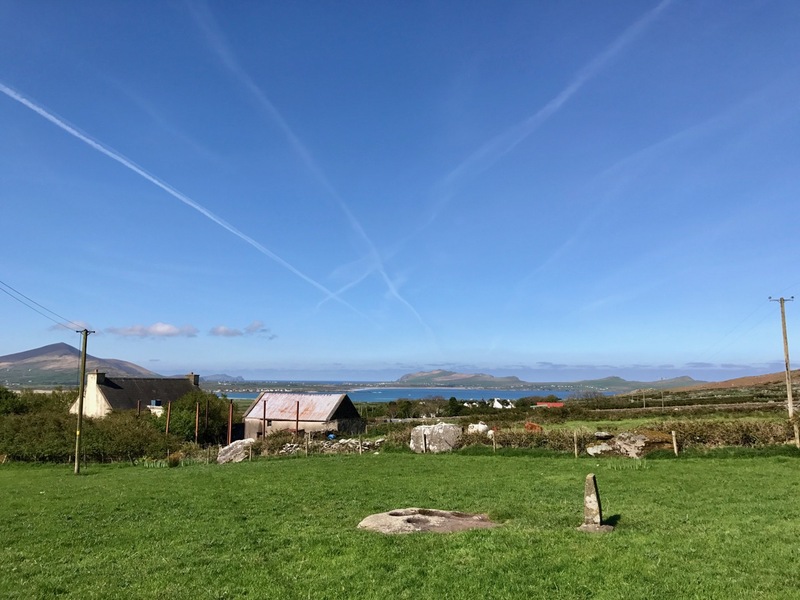 it seems that there are problems with the owner of St Brendan’s House – and its holy well! We were really frustrated by not being able to get into that site. I gather there have been access problems in the past, but supposedly resolved a couple of years ago – clearly they’ve come back: the barbed wire wrapped around the gate (and the whole boundary) sends a clear message! Such a shame, but the rest of our explorations were wonderful, as was the Kerry sunshine.